Buying a car is one of the best investments in life. And if you’re like us, you treat it like a baby to make sure everything is alright. But, have you ever opened the hood just to see your batteries corroded? Yes, it isn’t a pretty sight. On top of that, it can also cause dead batteries and hard starts when it builds up between your wires and terminals. It’s a serious problem—but what causes car battery corrosion anyway? A lot of reasons can be behind it and in this article, we’ll talk about those in detail. 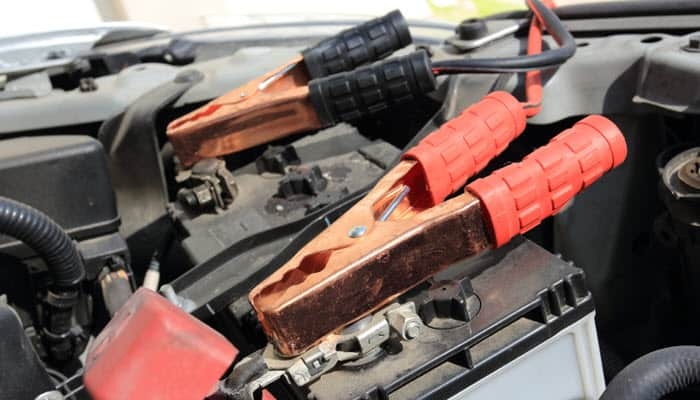 If your car battery is damaged and has cracks, electrolytes can leak through them. For sealed lead batteries, corrosion happens once these electrolytes reach the battery terminals. Flooded lead acid batteries have a higher chance to corrode. This is because while you’re too busy putting water into the battery, electrolytes can simply “jump out” from it. Terminals can get damaged when they come in contact with electrolytes. If there’s too much water in the battery, there is a higher chance for the electrolytes to come out of the vent and come in contact with the terminals. This then leads to your battery’s corrosion. An overcharged battery heats up easily. This causes the electrolytes in the battery to get jumpy, increase in volume, and get high on kinetic energy. The electrolytes can either leak out from the cracks or flow out of the vents. This may happen to both sealed and flooded lead acid batteries. The acids in the battery produce hydrogen gas. It’s also something we inhale every day and it seems so harmless. However, it can cause battery corrosion once it combines with other gases. When it forms on the left terminal, it can indicate undercharging. If it forms on the positive side, it can mean overcharging. Usually, copper clamps corrode when they’re used to connect the wires and the battery. Copper isn’t reactive itself, but the electricity that flows through it makes it corrode. Copper sulfate is also formed which can be dangerous for the battery. If you see a bluish substance around your terminals, it’s probably copper sulfate. You’re aware that batteries don’t last forever, right? There’ll be a time when you have to get a new battery for your car once you’ve used up the old battery. Usage ultimately leads to corrosion, which is also a sign your car needs new batteries. Note: car batteries have acid inside that can cause injuries. This is why eyeglasses and gloves are needed to protect yourself. Loosen the cable ends by disconnecting the negative cable first before the positive cable. Then, twist the battery cable end nut counterclockwise using a battery cable wrench. For top-post batteries, loosen the nuts until there is no tension on the clamps. If you have a side-post battery, you have to loosen the cable until it’s completely removed. Lift the top-post battery cable end from the terminal by wiggling the cable end off. Sprinkle enough baking soda on the terminals so they’re completely covered. Make sure to coat the area around them, too. Pour 2 tablespoons of water on each terminal. You’ll also notice that it will start to bubble—this chemical reaction neutralizes the acid to make your car battery safer to handle. Repeat step 1 and step 2 on the cable ends. 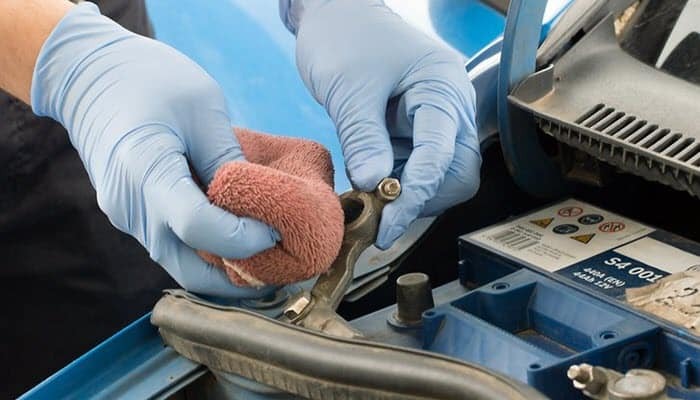 Use a stiff brush to scrub the corrosion off your car battery. Don’t forget to scrub around, inside, and outside the cable ends and the terminals as well. Rinse the battery and cable ends carefully with water. Use compressed air so your car battery dries entirely. Apply a thin layer of petroleum jelly on the terminals as well as the cable ends. The jelly will help conduct electricity between the terminal and the cable end and to prevent corrosion. After disconnecting the battery cables, spray some battery cleaner spray on the cable ends and the terminals. Doing this will neutralize the acid and corrosion on the battery. Soak the cable ends and the battery for a couple of minutes. The color of the spray may even evaporate. Spray some battery cleaner spray on the cable ends and the terminals again. If there’s a slight change or doesn’t change color at all, the acid has neutralized. Rinse the battery completely using water. Again, remember to be careful with this step. Note: Some battery cleaner sprays have dyes that can stain your paint a different color. Use a battery brush to clean the battery posts and the cable ends. Place it over the terminal and twist about 5 times around the post. Uncap the battery brush and insert it into the cable ends. Turn it around 4 times to remove all corrosion build-up inside the clamp. Spray battery protector on the battery terminals. Install the positive cable back to its position. Most top-post batteries will need you to wiggle or tap the cable end down to its position. 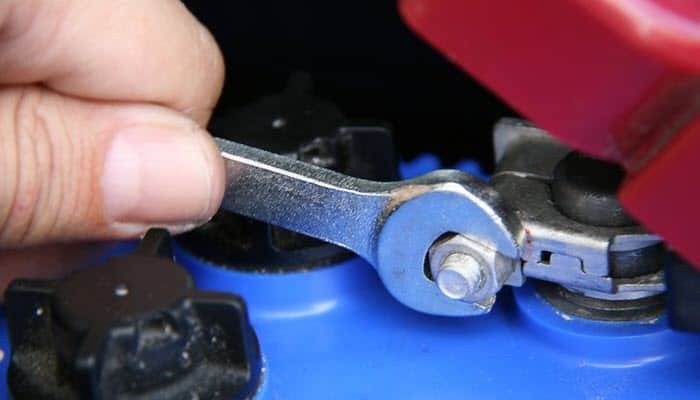 Using a battery terminal wrench, tighten the nut to the clamp until it snugs. Install the negative cable back to its position as you did with the positive cable. A well-maintained car battery is key to a successful performance. So, make sure to have it regularly checked to prevent it from giving up on you on crucial times.